VIDEO: NATO condemns what it calls Russian efforts to destabilize Ukraine, charges Moscow dismisses as 'conjecture.' VOA's Jeff Custer reports. NATO has called on Russia to cease its "illegal military operations" in eastern Ukraine, which it says are aimed at destabilizing the country. The comments by NATO chief Anders Fogh Rasmussen on Friday followed an emergency meeting in Brussels to discuss the worsening crisis. Rasmussen, referencing satellite images released by his organization Thursday, said it is now clear that Russian troops and equipment have illegally crossed the border into eastern Ukraine. He said this is not an isolated incident, but part of a pattern over many months to destabilize Ukraine as a sovereign nation. 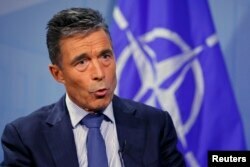 FILE - Secretary General Anders Fogh Rasmussen says NATO condemns Russia's 'continuing disregard' for Ukraine sovreignty. The NATO chief also said Moscow has fired on Ukraine, both from Russia and from within the country itself, where NATO estimates 1,000 Russian troops are operating. It says another 20,000 are marshaled near Ukraine's border. "We urge Russia to cease its illegal military actions, stop its support to armed separatists, and take immediate and verifiable steps towards de-escalation of this grave crisis," Rasmussen said. His comments camea day after Ukrainian President Petro Poroshenko said Russian soldiers and armaments had crossed into eastern Ukraine and seized the town of Novoazovsk. Ukraine defense officials said Russian armored vehicles had surrounded the town and that several nearby villages were also seized. Kyiv has asked NATO for support in dealing with the insurgents, who have launched a counteroffensive, allegedly with Moscow's help, to retake some areas in recent weeks. What Ukraine got was more supportive words, and a hint of more action next week at a NATO summit. Rasmussen said he will make clear to Poroshenko, at the summit in Wales, NATO's "unwavering support" for and "strong solidarity" with Ukraine. Ukraine’s prime minister, Arseniy Yatsenyuk, said Friday that parliament would be asked to give up the country’s non-aligned status and pursue NATO membership, Reuters reported. Rasmussen also said NATO leaders would decide at the summit on enhanced cooperation with Ukraine, including financing for upgrading its military logistics, command and control, and cyber security systems, and on help for its wounded troops. Russia has repeatedly denied arming or sending troops to assist the pro-Moscow rebels. "When such conjecture comes up and allegations about the Russian invasion are made ... it is probably connected to the fact that the rebels pushed the government troops back," Russia’s foreign minister, Sergei Lavrov, said Friday. He also accused the West of falsifying the satellite images. The latest Russian moves along Ukraine's southeastern frontier have raised international concerns that Moscow wants to create a land link between Russia and Crimea, the Ukrainian peninsula annexed by Russia in March. On Friday, Pentagon spokesman Rear Admiral John Kirby said the United States will continue working with the U.S.-led NATO and its European allies in supporting Ukraine and in providing "nonlethal" aid. But, he emphasized, "there's not going to be a U.S. military solution here," he told CNN. While NATO has planned military exercises next month in western Ukraine, far from the battlefront, experts say the likelihood of any overt military intervention is highly unlikely. Niblett said it is more likely NATO members will provide nonlethal assistance to Ukraine, impose stronger economic sanctions on Russia, strengthen its military presence in eastern member countries, including Poland and the Baltic States, and provide more aid to friendly non-members along Russia’s borders. European Union foreign ministers also discussed Ukraine's crisis Friday, the eve of an EU summit that is expected to focus on imposing additional sanctions on Russia. At the meeting in Italy, Estonian Foreign Minister Urmas Paet said sanctions on Russia have had "no real impact." He said it was time for the EU to consider other measures. Experts also say NATO members will be reluctant to accept Ukraine as long as it's in a conflict with Russia because the alliance is required to defend any member against attack. Preventing Ukraine from joining NATO is believed to be one of Russia’s main goals. And some experts say that could be a key element of a settlement, if Ukraine’s government is willing to pledge not to join the alliance. VOA's Al Pessin contributed to this report from London. Additional information was provided by AFP, AP and Reuters.